Concepts: Keyforge is a two-player game in which you strive to gather resources to unlock mystical keys. Players start their games with a deck of cards, each of which is unique and hard-set with their own individual randomly generated name. This name is printed across each card in your deck, so there is no deck construction – when you buy a deck, you use that deck (although you can always buy multiple decks and use each one separately). Your deck will contain actions, creatures and artefact’s, all of which can be used as you strive to gather aember. Gather six shards of aember to unlock one key, unlock all three keys to win the game. The starter box comes with two pre-constructed introductory decks, and two random decks that you can use to play the game competitively. Writing: The starter set comes with a quick-play guide to teach players how to play, but the full rulebook is available for free online. I would have liked if it were available in full in the starter set, though. But still, let’s look a bit at each deck and see what’s going on with them. Each deck is build to include cards from three different factions, and there are seven different factions that are possible. If you have ever played Magic: The Gathering, then some of these factions may seem familiar and comfortable to you already. These include the fiery and brutal Brobnar, the demonic and toxic Dis, the scientifically minded mad scientists of Logos, the ray gun wielding inhabitants of Mars, the divine healing knights of the Sanctum, the thieving goblins of the Shadows and the feral wilds of the Untamed. Each of these give quite a unique feel of play, and having three in each deck really does add to the strategy. Let’s discuss that. Mechanics: At the start of your turn, the first thing that players do (after they spend any aember to unlock keys) is to announce who their active faction for this turn will be. As each deck is made of three factions, this means that players will only ever be playing with up to a third of their deck on any turn, so choosing the right faction quickly becomes the most strategic choice that you can make. Once you have selected your active faction, you can play any cards from your hand of that faction, and activate any cards of that faction that are already on the table. This means that there is no additional cost in order to play a card – you can play a powerful rampaging giant or bloodthirsty demon just as readily as a cunning pickpocket, there is no mana costs or anything else to limit that. Once your creatures are down, you can use them on subsequent turns to attack your opponent’s creatures or to gather aember through a process called reaping, or to use any special abilities that they have. Design: The cards are printed to good stock, but you’ll want to sleeve them for repeated play. The art style is different for each faction – I personally like the Dis and Logos artwork the best, whilst the Shadows does little for me, but you’ll find your own preferences here. Let’s talk a little about how the decks are constructed. So, Keyforge as a game is designed to not really have a secondary market. You won’t be buying or selling individual cards at your local store. The main item that is being sold are the pre-constructed decks, called Archon Decks. You play as an Archon, a powerful godlike entity that leads their three factions that make up their deck. 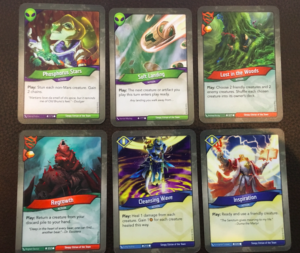 Each Archon has a name, which is the randomly generated one that is printed on all of the cards on your deck. 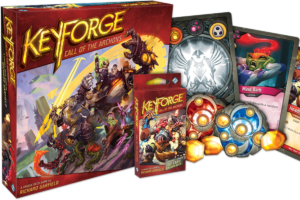 And this is the big thing with Keyforge – the idea that you can buy a deck, learn how it works, and play with that deck whether it’s at your local store, with friends, or at a tournament, without any construction to that deck. In fact, it’s impossible to reconstruct your deck – and, in theory, each deck is balanced, with the same formula for powerful cards or so on. That is where a lot of people are going to get up and walk off, though. There’s many card game players who love building their decks. And if this game isn’t for them, that’s fair, it’s a valid decision. One of the concerns that I have, though, is the hope that each deck is balanced. I think, if you have been playing games for a long enough time, you’ll have the experience to know that this is rarely how things actually turn out. Eventually there will be decks that are, even while pre-constructed, simply work better than others – and those decks will come to dominate their local meta. Now, while the game does come with a mechanic called Chains, which can limit the hand size of players who have more powerful decks like that, it’s going to be pretty freakin’ dreadful for a new player a few years down the line when they pick up their first Keyforge deck and wander into their local game shop looking for a game, only to find the ‘that guy’ who relishes pulverizing every new player he can to boost his own ego and will swear left, right and center that his deck is just as balanced as yours because this game doesn’t allow him to rebuild it. But then, isn’t that a problem that has plagued much of the Magic: The Gathering community too? In any case, how Fantasy Flight Games will try to handle situations like that in the future, if possible, remains to be seen, and I’m looking forward to seeing how they will rise to that challenge. Playability: So let’s go back to the actual gameplay for a moment. Once you and your opponent have played a few creatures and know which faction you’re choosing each turn, it comes to actually acquiring aember and hopefully taking out some of your opponent’s creatures via combat. 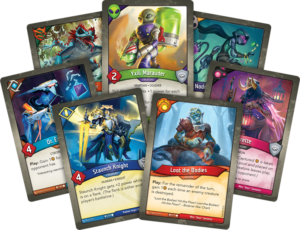 Combat is a natural part of how these types of games play, and in Keyforge it feels rather streamlined. Each creature has a power score, which works as both a measure of how much damage it can deal and its health. So in my “Lady Dynamite” deck (which is the best name for a deck ever), I have an Ancient Bear, which has a power of five. It can deal out five damage, and take five hits before it is dead. Some creatures, like the knights of the Sanctum, have an armour rating – armour reduces damage that the creature takes by that number per turn. That’s per turn, not per attack – so if you attack the same creature repeatedly on one turn, the armour won’t keep protecting it. Another option that you can use the creatures for is reaping, which activates that creature. That creature then generates one aember, which goes into your store pile. Activated creatures can’t attack or do anything else, and attacking also activates a creature, so by the mid-to-late point of a game you’ll want to try to have quite a few creatures ready to harvest aember for you. Once your creatures are finished their actions, they refresh ready for the next turn. You then draw up to your maximum hand limit (which may be reduced if the chaining mechanic is active) and it’s then over to your opponent’s turn. If you start your turn with six aember in your store, you automatically forge one of the keys. You can only forge one per turn, but once you forge your third key you are the winner. You’ll note that this means that your opponent will always have a chance to steal (an action that some cards allow them to do) aember from your storehouse on their turn, which can mean that you’ll often end a turn thinking that you’re about to forge a key, only to start your turn without enough aember to do so anymore – that’s a lovely mechanic and works very nicely, keeping the excitement and flow of the game quite exciting. Conclusion: Despite some concerns about how the game will continue to implement a fair balance in their decks in the future, I still find myself decidedly enjoying Keyforge. The game’s emphasis on resource gathering feels interesting and involving, and you quickly feel as if you’re in charge of a rather competitive mining corporation. Maybe that’s not quite the intended feel of the game, but it’s what I got. I like the to-and-fro of gameplay, and the cards have a huge variety of special abilities that really add to the flair and excitement of the game. One issue that I will note, though, is that your game table does tend to get very busy quite quickly during the game. All creatures are laid out in a single line in front of each player, called the battle line. This is actually rather important because many creatures give benefits to their neighbors, and some creatures have special abilities if placed on either end (flanks) of the lines. However because only one faction is active at any one time, it means that a lot of these creatures just aren’t doing anything from turn to turn unless you happen to need to use their faction. You’ll either want a long table, or to be playing rather aggressively to kill off these excess creatures, because there can be a lot of clutter. At the end of the day, our games of Keyforge turned out a lot of fun! We liked gathering aember, we liked stealing each other’s aember. We liked forging keys with them (although I found myself wishing that each forged key also unlocked new abilities – perhaps an idea for later expansions, Fantasy Flight?) and we absolutely loved choosing which faction to play at the start of each turn – this in particular stood out as the best moment in the game, the most strategic and the most fun. 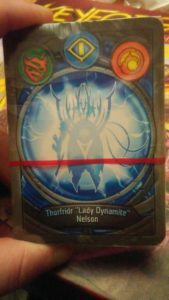 And for those who are curious, our starter box contained two sealed decks – their names are Ormarr, Aged Village Hammer, and Thorfrider “Lady Dynamite” Nelson. FINAL THOUGHTS: Keyforge is a fun, flexible game that feels like it hits the perfect balance, neither too intense nor too light. Come for the funny deck names – stay for the involving and exciting gameplay!